Step 1 Trim ends, then cut each head of radicchio into lengthwise quarters and then into crosswise ribbons about 1/4 -inch wide. Combine the radicchio in a cold skillet with 3 tablespoons olive oil, garlic, salt and balsamic vinegar. Cover and cook over medium-low heat, stirring occasionally, until the radicchio has softened, about 10 minutes. Step 2 Reduce the heat to low and cook until the radicchio is quite soft and the bitterness has cooked out, about 5 minutes more. Season to taste with salt and perhaps just a little more balsamic vinegar. Remove from heat and set aside. Remove the garlic before serving. Step 3Slice the baguette into 1/2 -inch slices and toast until lightly browned on both sides. Step 4Spoon a heaping teaspoon of the radicchio marmalade onto each slice of bread and top with a similarly sized spoonful of burrata (try to get both the filling and the wrapping in each spoonful). Sprinkle each with a light grinding of black pepper and a drizzle of the remaining olive oil and serve. In Recipes-list.com we have selected the most viewed recipes from category - Appetizers Best recipes Vegetarian . Enjoy the best recipes specially selected for you! 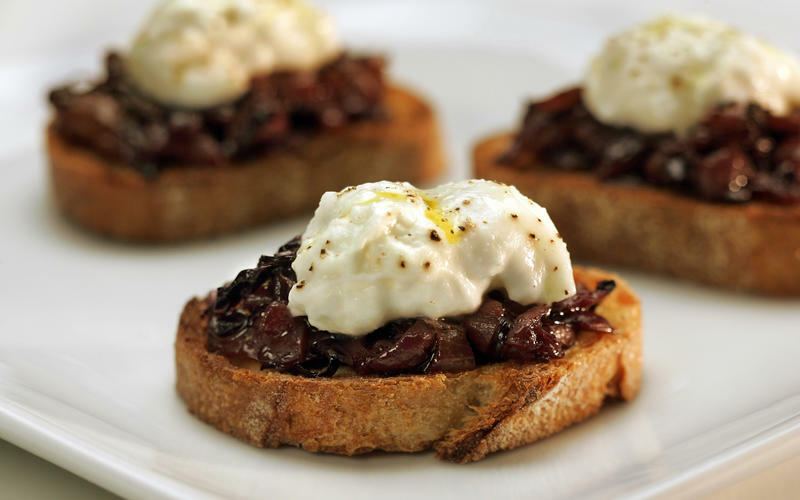 Bruschetta with burrata and radicchio marmalade is the right choice that will satisfy all your claims.